All my knitting this week seems to have had a circular theme. Firstly I am almost finished the circular yoke cardigan - just the button bands to go. As the main body of the cardy is black this will have to wait for a day with more light - I just looked out the window and it's snowing again! That wasn't forecast. It's mostly knitted in Stylecraft Charleston with the yoke in random stripes of Wendy Fusion in Berry and some handspun in various shades of green. It's very heavy and rather on the large side making it the perfect sweater for snuggling into on cold days. I'm planning to put odd vintage buttons on the front. 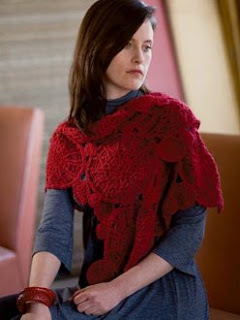 Also on the needles at the moment is Astrid from Norah Gaughan 1 (picture from the Berroco website). Here is one of the large circles blocking. There will be 14 of these large circles (so far I've only done 4), and about 35 others in small and medium which are all stitched together to make the scarf. I'm knitting it in some old Jaeger Alpaca in a lovely petrol blue. It may take some time as knitting the circles is a bit fiddly - the large circle needs three different sizes of needle! Next up will be a Mobius shawl from Cat Bordhi's Treasury of Magical Knitting. This book was a Christmas present from Pete and this will be the first thing I'm going to knit from it. I'm planning to use that purple handspun from the fibre I got from Gnat and Sheryl in Florida, mixed in with some odd strands of other stuff to give it a bit of extra texture and pizzazz. Today while knitting I've been listening to C J Sansom's Shardlake series. I'm on Dissolution at the moment and enjoying it very much. I have read the book before but I'm still enjoying the audio (though it is abridged). Lovely stripes on that yoke! I came to see your Sinple shawl and see your not-so-simple Astrid instead! I didn't realise it took so many circles or so many needles.